Nice view, Ken. Thanks for posting. Of course, we’d expect Lowestoft to support the local firm, wouldn’t we. The application of the livery is reminiscent of Newport who, until not long ago had a green and cream version and it’s reminiscent of the Dinky Toys STL. Beautiful picture of a beautiful bus. Just think of what we were deprived of by the Transport Act. ECW bodied AECs from 1948 to 1965 – not to mention Roe or Weymann bodied Bristols. I Remember traveling on this bus up the Norwich Rd when in my teens plus other routes in Lowestoft. Bad day when the corporation buses were taken over by the double n people. I’ve just read the article at the link above – what went wrong at Lowestoft/Waveney? In the late 1960s it seems Lowestoft Corporation considered selling the bus undertaking to ECOC, but finding the offer unacceptable then proposed route extensions . . . but lost-out in the traffic courts to ECOC. In April 1974 a joint services agreement with ECOC was reached . . . which was dissolved in March 1976, when most of the services reverted to ECOC. Seemingly reduced to being a one-route operator Waveney DC threw in the towel in December 1977 and sold the undertaking on to ECOC. I have a Lowestoft Setright ticket from the days of Waveney DC, which is titled "Lowestoft Passenger Transport – Waveney DC Lowestoft…etc" (in black). Did Lowestoft vehicles wear this livery (with traditional lettering) to the end? and what changed when it became Waveney?? I’m not sure if I’ve ever seen another ECW body like this one – it seems to have more than a touch of the Park Royal about it. It’s certainly very stylish and it’s fortunate that it’s been preserved. Maybe just the angle, Chris, but it’s the standard body for the time as found on numerous Bristol Ks and Chris Y’s favourite PD1As. It also appeared briefly as a Northern Coachbuilders’ body – as in the Newcastle Regent III. The livery not being a Tilling standard makes a lot of difference! There’s always been something of a mystery about these vehicles, there were ten of them, the only AEC Regent II’s bodied by ECW. Lowestoft had nine of them, the tenth went to Ebor Transport of Mansfield and was registered HAL 841. Nine would seem an odd quantity for Lowestoft to order and it seems equally unlikely that Ebor would have chosen ECW to body an odd Regent. I’ve always thought they must have been one batch so did Lowestoft order ten and then decide they only needed nine? Perhaps we will never know now. Incidentally, HAL 841 entered ‘Tilling’ ownership when Ebor was taken over by Mansfield District. Chris B, Messrs Doggett and Townsin’s Book ‘ECW 1946-1965’ mentions the nine ECW-bodied Regent IIs for Lowestoft and that "a tenth body of similar design was built on the same type of chassis for the Ebor Bus Co Ltd". The text also states that the Lowestoft vehicles had body numbers 1579-1587, with the Ebor body directly following (1588). 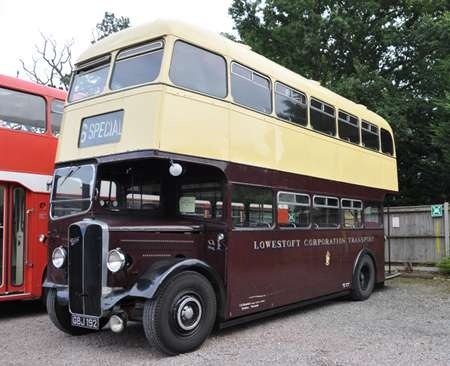 It does seem odd as you say, that the independent Ebor asked ECW to body one chassis, but the authors also mention that another independent took delivery of six ECW-bodied Leyland Tiger PS1 buses in 1946/47, namely Birch Bros of London. David O’s comments about the Transport Act depriving us of some fascinating chassis/body combinations certainly rings true. Just imagine a Roe-bodied Lodekka, or ECW-bodied Daimler CVG6…. But we did get ECW bodied Leyland PD2s and Leyland Leopard L1s for Sheffield Joint Omnibus Committee and Bristol LSs and MWs with Alexander bodies for Western S.M.T. Also rebodied Bristol Ks with Weymann bodies for Maidstone and District. Thanks Stephen, that’s very true, and how could such gems have slipped my mind? (Especially as the Sheffield examples are shown on this very website!) 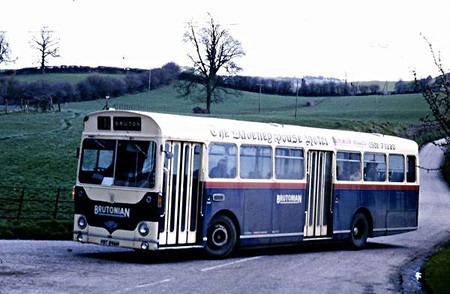 On the same tack Rotherham had batches of East Lancs-bodied Bristol K and KS types. 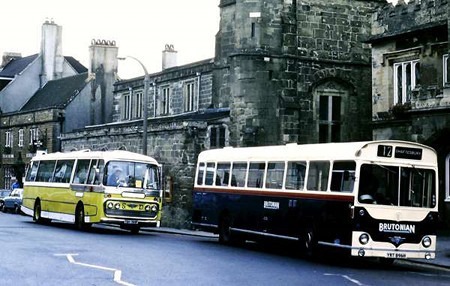 ECW bodied Albions for Red & White, and Guy Arab IIIs for Middlesbrough, as well as Leyland Royal Tigers for United (coaches) and Cumberland (buses). One tends to forget just how many advance orders had been placed with both Bristol and ECW for delivery after the nationalisation watershed of 1948. West Yorkshire also had a batch of prewar Bristol k’s rebodied by Roe in 1953 of which KDG 26 (CWX 671) is still with us. Two none Bristol ECW bodied vehicles from the United fleet. Both are PSU1/15 Leyland Royal Tigers. 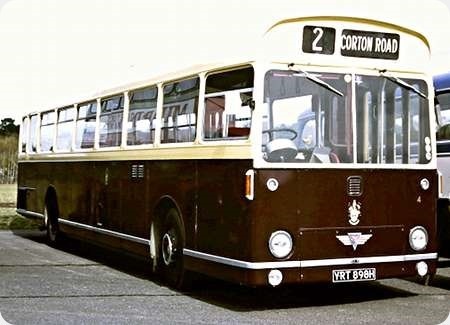 LUT1; PHN 801 was one of nine C39F coaches bought in 1952 for the Tyne Tees Thames Newcastle London route: LU4; RHN 766 was from a batch of B45F service vehicles from 1953. I don’t know the ins and outs of what happened at Carlisle, but when LU4 was based there, the depot was run by United, some Darlington registered vehicles ended up in the Ribble fleet, and then I think all Carlisle operations became Cumberland. Perhaps someone can enlighten us? Ronnie, So far as I am aware, United operations in Carlisle passed to Ribble when NBC was established. With the run-up to privatisation, Ribble was split, and the northern area passed to Cumberland, while the Liverpool area (did it include Southport?) went to a new firm reviving the old North Western name. Others may know otherwise! In the old days, when we were young, there was a lot of BET/Tilling overlap. There was also a lot of historical "baggage". 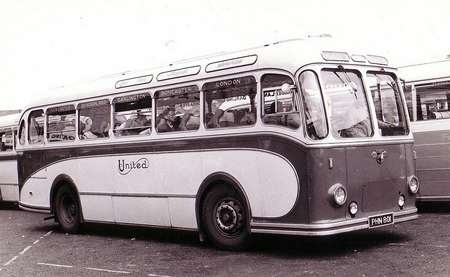 United historically ran Leyland coaches – and continued to do so as long as possible. Cumberland had at least 50% private ownership and were a Leyland fleet – until Tilling came into the ascendency in the ’50s. Carlisle was given to Ribble by NBC in 1969/70. When Ribble and Cumberland came into common Stagecoach ownership, Cumbria went to Cumberland and Lancashire to Ribble. I know, I’m a bit behind the thread, but thanks to Ken Jones for posting the photo of Lowestoft Corporation No.21. As I’ve only just seen it on the website I must a rant as this bus is one of my favourite machines. Everything about it takes my breath away. The deep maroon and primrose livery which appears quite plain and Dinky 290’ish, which in itself is a lovely period half and half style, has thin black lining, then emblazoned along the lower panels is the large serif Corporaton fleetname. Inside, a lovely maroon chain-link style moquette covered the seats (see photograph). 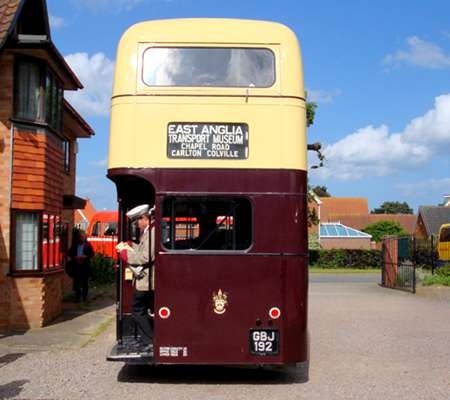 The Regent II/ECW combination always fascinated me and eventually I got a ride on this wonderful bus at the 2012 ECW 25 year Commemoration weekend. I didn’t realise, until I read Malcom R. Whites "Lowestoft Corporation Transport- Bygone Town Services" (ISBN 0-9532485-9-3) book how the Corporations routes were severely restricted to basically north-south with loops on each end and have always wondered why they were not extended inland to places like Oulton Broad and Carlton Colville. The Rotterdam Road bus depot building still survives, but now owned by an industrial concern. W Alexander & Sons had 12 Daimler CVD6s with ECW ‘Queen Mary’ coach bodies, complete with the Alexander Bluebird emblem. It doesn’t get more mouth-watering than that! 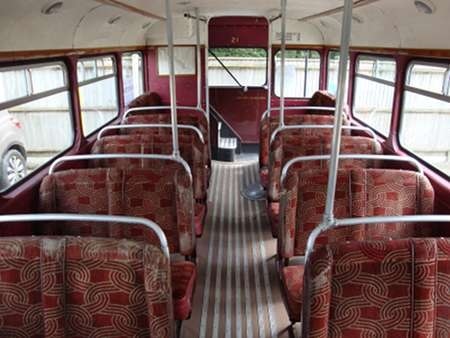 Just to support the latest thread on this marvellous bus a couple of photos one of the interior of lower deck and a rear view. This beautiful moquette pattern, but in blue and cream, was used by Roe in the two new bodies (lower saloons) fitted in 1951 to Samuel Ledgard’s two utility Guy Arabs. I always thought it to be a most appealing design, bold but tasteful. I’m a bit slow replying, David O, but you are right about the vehicle looking different when not in Tilling Green. SEE my post www.old-bus-photos.co.uk/?p=4321 And the AEC rad also tends to fool the eye. Finally, the light upper colour diminishes the rather high front roofline which these highbridge bodies possessed. It’s a very satisfying body and livery. 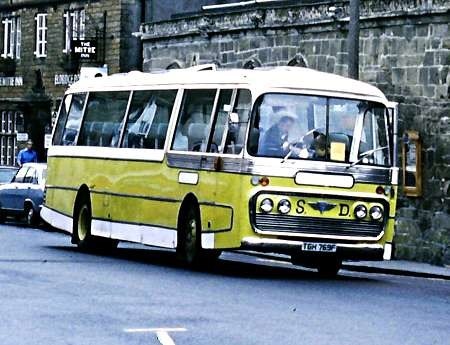 I only found out today whilst perusing the latest edition of Classic Bus that this style of 5 bay ECW body (albeit in lowbridge form) was fitted to a Daimler, a CWA6 which had been rebodied by one of the Scottish companies. You learn something new every day! Having done much work on this bus during its restoration , I can add that it is a standard ECW ‘K” body fitted to a Regent II chassis this is highlighted around the cab front end area when compared to the Bristol variant , either way it sits well unlike some body builders efforts , another issue that affected maintenance of these vehicles was the provision of the trapdoors in the cab for the starter motor was not ideally suitable and same with the gearbox lifting eye in the lower saloon was too offset to be of use. Another point of interest was the Ebor body no. was found on our example on some of the internal panels I can understand other body numbers being found from the Lowestoft batch because of salvage etc. 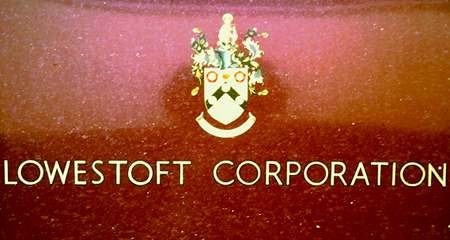 Graham Watling wonders why the Corporation never operated to Oulton Broad and similar. The answer lay in the licensing system whereby the traffic commissioners had to always give the licence for any new route to the "established operator". Thus because Eastern Counties was the first to provide services to Oulton Broad and Oulton, the corporation had no chance of obtaining a licence to operate to those points. The system produced utter farce at times, such as when the Corporation applied for a town centre to Hollingsworth Road service, it could not have a stop in the lower portion of Rotterdam Road because that might lead to abstraction from ECOC service 3, which did not serve the Gunton Estate! To hell with the customer, the bus company interest came first, I know I was one of many who complained about the bad behaviour of ECOC to our local MP and the Department of Transport. The deregulation of buses was welcome, but unfortunately threw out the baby with the bath water, so that we lost local council fleets in many cases whilst happily getting rid of the NBC and PTEs. These buses provided a source of pleasure to me from late 1966 when I moved to Lowestoft. Wonderful sound effects! I have an amusing incident concerning one of these lovely buses. I got on one at Station Square one evening after travelling from work at Norwich. The crew boarded, a short pause and communication between them followed, then the conductor asked the men in the lower saloon if we could give the bus a push as the starter motor was stuck. We duly obliged and the bus was soon under way. Happy days! Perhaps Peter Short can answer a question about these buses. they are shown as Regent IIs but the chassis numbers all commence 0661, which of course is the Regent I So are these really Regent IIs? Brian Moore mentions the "push starting" at Station Square. Well in about 1969 a fellow passenger, the conductor and I had a similar "stuck" starter motor at the No 2 Gunton Drive/Gunton Drive terminus one cold morning when I was trying to get to the station. It was a bit of a push as the road there had ruts caused by the bus wheels always stopping in the same place….! I have just overhauled and re fitted the rear axle on this and if this is any use Brian Moore the chassis number is 06611945 also the rear axle had so many part what no other Regent II had i:e parallel rollers instead of tapered roller bearing and the only explanation I can come up with is that AEC must of used up all the parts from Regent I as I believe these are very early regent II? so effectively it is just a Regent I underneath. Also was number 27 an AEC Regent III? In reply to Connor’s 08/01/16 question about number 27 which I believe was the bus with the missing starter tooth, it would have been from the same series ie 19-27 like number 21. None had direction indicators which in the late 1960s caused much confusion with holidaymakers used to such modern extras as the drivers hand would only stick out about 10 inches from the cab window! 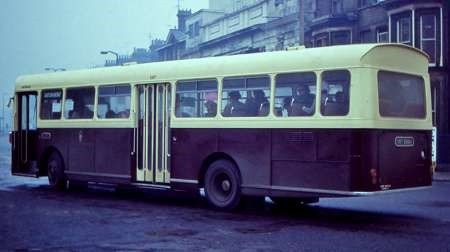 The 19-27 series was withdrawn around 1969 to be replaced by the Corporation’s first four front entrance/centre exit single deckers numbers 1-4. Numbers 28 & 29 were of a later vintage and were around 1969 retrofitted with indicators! I recall some early/mid 1960s AEC & Leyland double deckers too which had replaced some war/post war utility buses.